On day 13 of 16 days for youth – we witnessed how helping one person can enable another to help others. 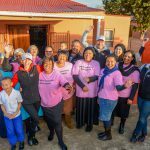 Last year Tannie Magda from Paarl received a brand new kitchen to help her feed more people in her community, this year she is along for the ride, and assisted us in the small fishing town of Paternoster. 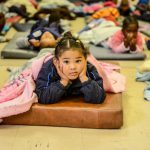 In Paternoster we found a lady named Krista Taylor – who is a safety parent, assisting children who have been taken from their homes due to abuse, or neglect. At the moment she is taking care of a 4-year-old girl named Ayolise –who was found by police after being abandoned by her mother. Aunty Krista’s dream was to start a soup kitchen, after she saw the need in her community. She says the people in Paternoster are struggling with unemployment, and many families are reliant on an income from fishermen in their families. The Heart FM team, assisted by Tannie Magda we helped Aunty Krista start her very own soup kitchen. She fed the children and adults in the community soup, vetkoek, and sausage with the donations from Heart FM, Tannie Magda and Brito’s butchery. During our daily Power Hour people across the Cape donated tokens of electricity to aunty Krista, which amounted to 4 thousand units. Heart FM with tools given by Hilti built a carport – so she can have a place to make her soup –shielding her from the rain in winter. Heart Breakfast’s Julian Naidoo and Aden Thomas went to the shops in the area, bought aunty Krista groceries and bought clothes for Ayolise.